Out of the hundreds of tweets that flood my Twitter feed daily, I was lucky enough last Wednesday afternoon to catch a 140-character dance battle developing before my eyes. The exchange, between venerable New York City-based dance critic Claudia La Rocco, student blogger Alexandra Villarreal, and eventually, Katherine Brooks, Senior Arts & Culture Editor of The Huffington Post, centered around journalistic quality in the dance field, a topic for which La Rocco happens to be a particularly well-known advocate. The conversation began when La Rocco tweeted her critique of Villarreal’s article “Why Maddie Ziegler Matters to the Dance World,” which recently appeared on the The Huffington Post’s Arts & Culture website. As La Rocco so aptly puts it, “this is nutso.” It’s troubling enough that Villarreal equates “dance” with “American ballet,” dismissing the fact contemporary concert dance is created around the world (ahem, Ohad, Jiří, Pina, Akram? ), and perpetuating the myth that all dances (and dancers) of note are descended from a ballet lineage. The growing popularity for flamenco, sabar, and Bharatanatyam in New York City and beyond, and their increasingly frequent interaction with American modern dance, apparently doesn’t mean much to Villarreal. But even if Villarreal is focusing her version of dance history on American modern dance, her dismissal of over 50 years of innovation is irresponsible. 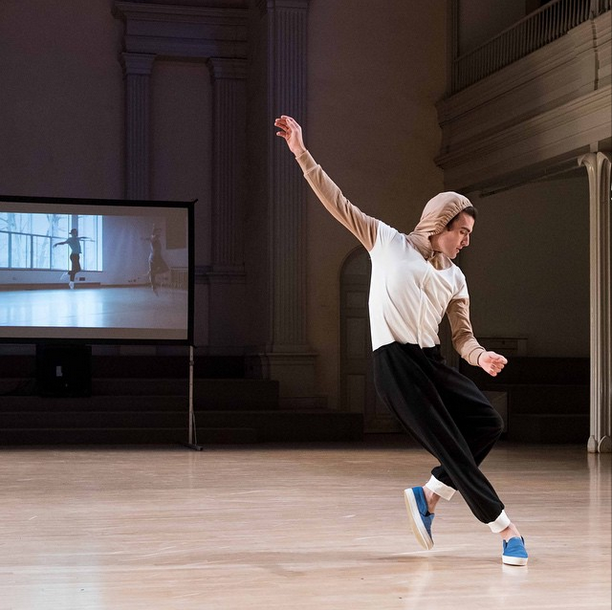 In fact, I would argue that dance creation has boomed since the 1960s, thanks to the Judson Church cohort’s affirmation that any move can be a dance and any place can be a stage. Advancements in video technology have ushered in an era of dance on film, which lent itself well to pop music videos in the 1980s and viral dance videos in the mid-2000s and beyond. Oddly enough, it was just this type of viral video that brought Ziegler into the public eye. To be fair to Villarreal, the system is working against her – by publishing Villarreal’s writings as independent blog posts (though this is not explicitly stated on the webpage) rather than as edited work, the Huffington Post gets free content and free publicity. Aspiring writers like Villarreal do exactly as Villarreal did, sending links to their newly minted bylines across all types of social media platforms in attempts to get exposure (and, maybe someday, a paid writing gig). Furthermore, blogs don’t receive editorial backing, leaving HuffPost free from responsibility when a writer like Villarreal goes historically rogue. When all was said and done, La Rocco shined as the champion of dance criticism that we’ve long known her to be. In an online world filled with click-bait journalism and BuzzFeed gif lists, she is out there fighting the good fight to keep dance criticism out of the gutter. Indeed, she created The Performance Club for the purpose of creating “journalistic space for thoughtful consideration of art” where (virtual) public engagement and debate are encouraged. Rather than dashing off review after review, La Rocco wants us to take the time to consider the questions of cultural memory that exist throughout all genres of journalism: what does this mean, why does this matter, and where do we go from here? 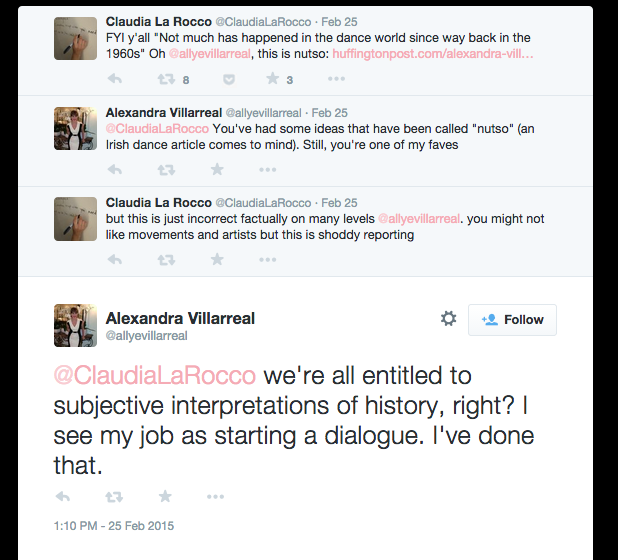 Coincidentally, La Rocco and her connective approach to dance criticism were already on my mind when I stumbled on this Twitter exchange. A few days before, I had attended a performance at Danspace Project of PLATFORM 2015: Dancers, Buildings and People in the Street, a multi-week series of events curated by La Rocco that centered around the premise of connecting New York City’s often disparate worlds of ballet and contemporary post-modern dance. The focal point of the project was the creation of new works that meld the two camps: La Rocco paired ballet dancers with contemporary choreographers, and asked them to work together to create a new dance project. The night I attended featured Will Rawls with Kaitlyn Gilliland and Silas Riener with Adrian Danchig-Waring, the first couples in the series to show their works. In her brief speech introducing the performance, La Rocco (who is, perhaps not coincidentally, also a poet) mentioned the influence of dance writer Edwin Denby and his ability to draw connections between trends in different dance circles of on the field of dance criticism and on this PLATFORM project (Dancers, Buildings and People in the Street is the title of a collection of Denby’s dance writings published in 1965). Ironically quoting Villarreal, what La Rocco has set up is the infrastructure for “starting a dialogue.” The time and the place have been set up, so all that’s left for the artists to do is show up and start talking (and dancing). As revealed last Friday night, what came out of the conversations between Rawls and Gilliland and Riener and Danchig-Waring was nothing short of inspiring, for these artists had a lot to say. I came to the performance to see Kaitlyn Gilliland – we met a few years back dancing with Columbia Ballet Collaborative, and I’m always excited to see her tackle new ideas about where and how she can move. But even as someone who’s kept in touch and followed her story over the past few years, I was blown away by how willingly she and Rawls accepted us into the intimacy of their project. Their duet, entitled #loveyoumeanit, was staged as a conversation: in the first section, Gilliland and Rawls read back and forth excerpts of text message conversations they had throughout their time leading up to the performance. It’s a comment on tech culture – since an emoji is worth a thousand words nowadays – and a glimpse at how quickly a relationship can grow. Through text, Gilliland and Rawls talked about her frustration with a stats course, his father’s health scare, their constantly changing rehearsal plans. As they sync their schedules, their lives follow. Dance brought them together, and iMessage kept them there. What’s missing from these text conversations is information about the rehearsals themselves, since (we can only assume) Gilliland and Rawls are speaking directly to each other in the studio. How they’re developing their dance piece, we don’t really know. Whether a dance piece existed at all, actually, is left as a mystery – Rawls eludes to making a ballet for Gilliland, but when will that be performed? In the end, it’s unimportant, because they’ve been creating a work of art all along: the constantly growing “text” that defines how they will “read” each other the next day in rehearsal. Eventually, we do see Rawls’s ballet. In the duet’s second section, Rawls coaches Gilliland through three variations, performed en pointe, but in sweatpants and a leotard with no tutu in sight. Here is our chance to glimpse the text’s missing chapters, the time spent in rehearsals where bodies communicate better than words. It’s tempting to say that the theme of the work is “the process is the product,” but there’s so much more going on. With #loveyoumeanit, Rawls and Gilliland recreate their world of the past several months, and though they may be the only two permanent residents, tourism is welcome. Riener and Danchig-Waring’s duet, comparatively, is less about where worlds collide and more about where worlds overlap. Their partnership culminated in the creation of a dance film that served as the backdrop for an extended solo by Riener. (Danchig-Waring did not perform live.) Both Riener’s solo and the film suggest that Riener and Danchig-Waring spent their rehearsals trying on each other’s techniques. In one of the film’s most memorable moments, Danchig-Waring teaches Riener a balletic phrase filled with punctuations reminiscent of Justin Peck pieces. Over and over, Riener tries to replicate Danchig-Waring’s explosive cissone arabesque, and though they eventually continue to move through the phrase, they keep returning to this move, the arabesque, that is so symbolic of Ballet with a capital “B”. In Riener’s solo, he really does put ballet on his body, wearing a full-body suit styled to look like a Halloween-costume version of a boys’ uniform at a professional ballet school. However, his movements belie a strictly balletic intention just as quickly as his costume. Throughout the solo, Riener starts with one move from ballet’s vocabulary – for instance, a jeté – and repeats it over and over until the movement naturally grows out of the balletic form and into new shapes and trajectories. Through this process of organic development, Riener both breaks down and builds back up these simple ballet steps. A jeté by definition is a jump from one foot to the other, and Riener explores the full range of those instructions by varying the speed, size, and direction in their execution. Eventually Riener loses the ballet boy costume, but the question remains the same: can this body, with shoulder-length braids and Cunningham training, be a ballet body? Does performing ballet steps make one a ballet dancer? As Riener’s virtuosity shows, ballet and modern dance techniques can certainly coexist, and there’s so much to be explored when they do so in one body. As a critic who connects, La Rocco has absolutely done her job well. Her initial questions of “What would happen if…?” has been boldly enlivened by these four dancers, shattering the myth that ballet and downtown dance are different strokes for different folks. As they say, ask and you shall receive. So, to Ally Villarreal, I offer the following, from one dance blogger to another: dance is more than the annual line-ups at Lincoln Center and The Joyce. When in doubt, see something new. Venture below 14th Street, or, if you’re really daring, to Brooklyn or Queens. I certainly don’t know everything about dance, and I don’t have an editor to help me along, either. But, I do know that I’ve seen some truly inspiring work in places that aren’t listed in the Times. As La Rocco reminds us, writing about dance “takes humility in the face of all you don’t know” – how can we write about dance if we don’t know what we’re writing about? PLATFORM 2015: Dancers, Buildings and People in the Street continues through March at Danspace Project. Visit their calendar for a complete list of programs.